$12,220,000 MILLION REASONS TO PLAY! Jackpot Giant is the BIGGEST progressive online slot game found at Fly Casino. 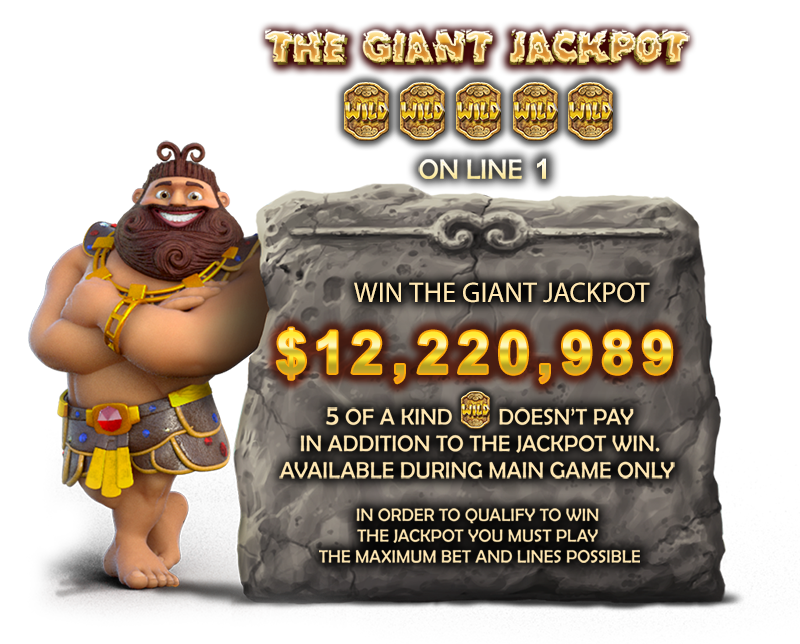 Jackpot Giant takes you back to the Stone Age while you play this 50-Line game to win yourself a future of obscene wealth. The game features stacked symbols and there are two variations of these stacked symbols which show the giant himself behind a volcano and behind trees. The stacked symbols will occupy two vertical reel positions that can result in impressive winning combinations. When you bet the maximum lines/wager and get a 5 wild symbols on payline #1. This will trigger the progressive jackpot which currently stands at over $12.2 MILLION! $30 gets $40 X 2 Sunday! On Sunday from 00:00GMT until 23:59 GMT, all members on their deposit of just $/£/€30 or more will receive a $/£/€40 bonus. Claim it 2X! Lucky 9’s! From 00:00GMT until 23:59 GMT, all members on their deposit of $/£/€30 or more will receive a 119% bonus up to $/£/€119.00. $300 BIG TUESDAY! From 00:00GMT until 23:59 GMT, all members on their deposit of $/£/€30 or more will receive a 75% bonus up to $300.00 bonus. $220 Thursdays! From 00:00GMT until 23:59 GMT, all members are invited to receive a $/£/€ 110 bonus up to $/£/€ 220 on your deposit of $/£/€ 30 or more.